Are you tired of wearing that temporary crown and having to return to the dentist for that second appointment just to get one tooth fixed? 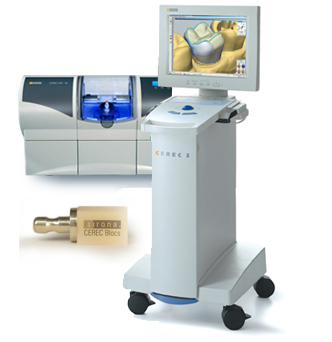 Well with CEREC CAD/CAM technology all that can be a thing of the past. Here at Create-a-Smile we use SIRONA CEREC computer technology to design, mill, and glaze crowns all in the office while you wait. When it is completed the crown is delivered and you walk-out of the office with your crown permanently cemented that same day. It get’s better. The crowns are milled from premium Lithium Disilicate which is both extremely strong and esthetic. So it looks good, wears well, and has high fracture resistance. Once the tooth in question is prepared for a crown, an optical impression using an intraoral camera is made, and from there, the doctors design your new crown on a computer and the send the design information to a milling unit from which the crown is fabricated. So, next time you are in the dental chair ask the doctors about CEREC technology and how it can help you. No more second appointments. No more fumbling with sensitive temporaries. Here at Create-a-Smile we are proud to leverage technology to give you the best dentistry the profession has to offer.